The good folks at Thompson and Morgan have included our Quest for Veg blog on their own blog. 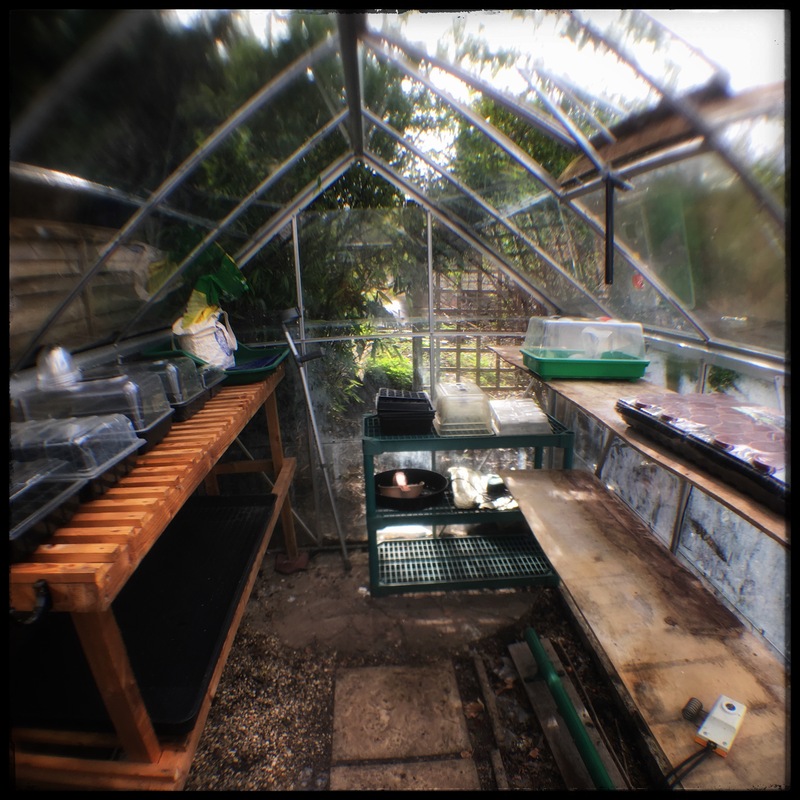 We’re thrilled to have been included in their feature, Blogs to inspire you to grow your own. The generous contribution of their time has meant that we have accomplished in a few short weeks, something that would have taken the two of us months and months. They were also able to step in when Andrew was tempted to overdo it so that he didn’t end up hurting himself. From here, we were planning to let the remaining weeds grow a bit and spray them with a glyphosate based herbicide. But we are now thinking that we will skip this step and simply cover the ground with a geotextile. This is because we don’t want to wait for the weeds to grow, we want to get on with it! Our plot is not big – at about 100 square metres; it’s considered a mini plot as it is not quite a half plot size. Nevertheless, it’s quite a lot for us to manage. 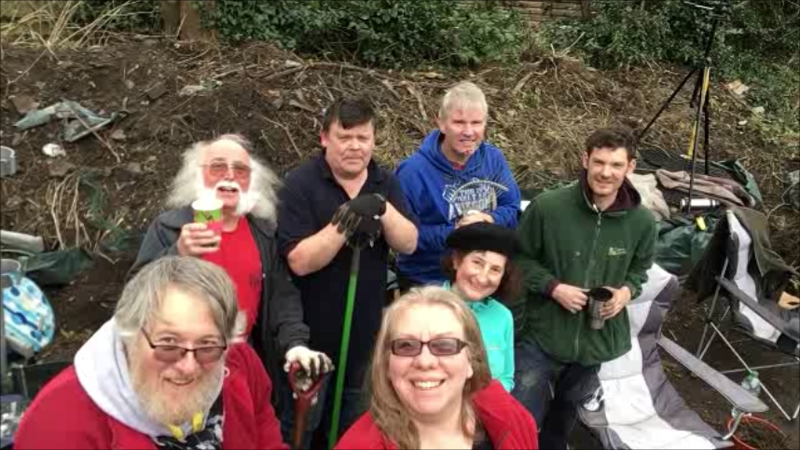 So, we were very grateful when our good friends from The Secret Garden offered to help. We decided to hold a weeding party. We started the day with a preparatory picnic of warm bacon rolls and flasks of hot tea and coffee to get us ready for the task ahead. Elisa, Rodney and Sandra started at the far end of the plot, while Andrew concentrated on the raised areas where the shed and old compost heaps used to be. In three hours, we managed to get about half the plot weeded. And we found all sorts of nasties including bramble, dandelion, couch grass, nettle, green alkanet, bindweed, Japanese ground elder and raspberry. 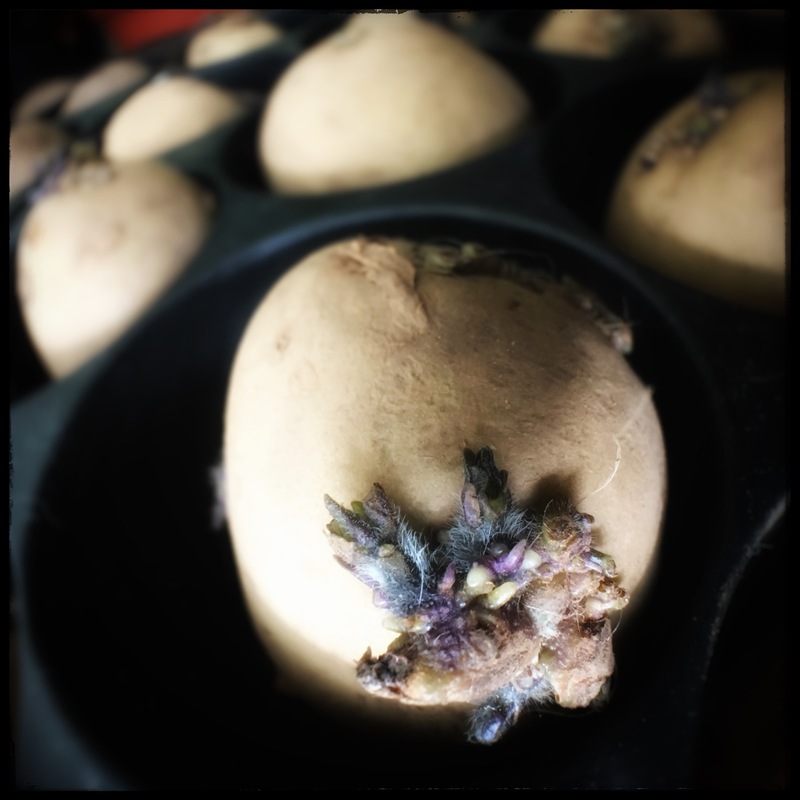 We also found a few old potatoes and a rhubarb crown! Our haul of weed roots from between a third and half the plot. From the raised area, Andrew pulled out this huge string of weed that has a little bit of nettle, couch grass, alkanet and bindweed! Here we are posing with our morning’s haul. Posing with our morning’s haul. Below is a before and after shot. We still need to work on the half closest to the camera. But that’s a job for another day. 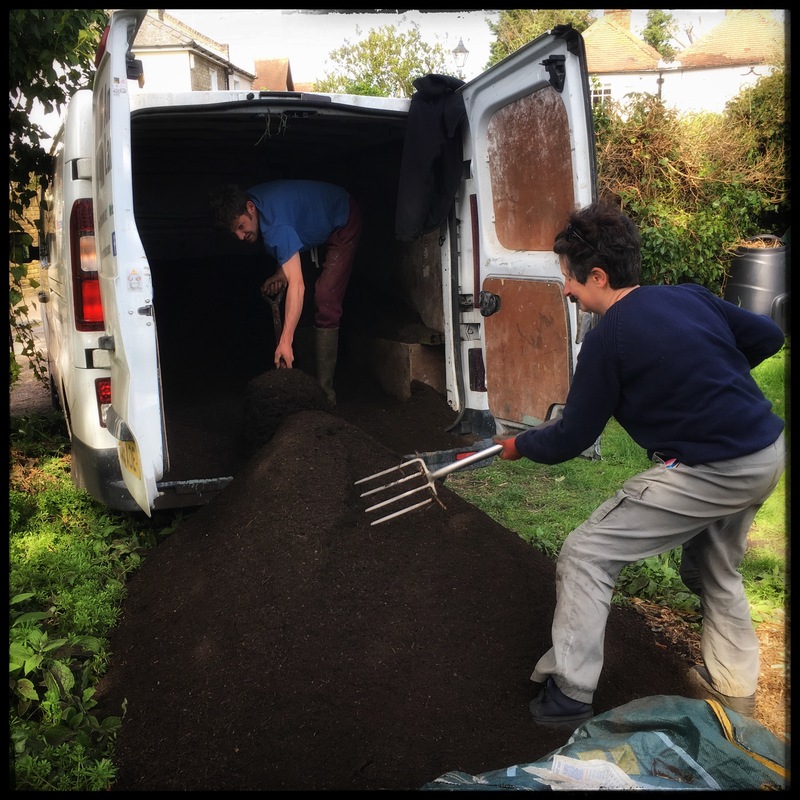 Having cut down and burned the shrubs, brambles, small trees, grass and other weeds, our thoughts turned to turning our soil. and finally, once the current crop of weeds have died off, cover the soil with a geo textile, perhaps mypex. It means that we can’t be organic while we’re clearing the plot, but it is something we want to work towards. We inherited many pernicious weeds, some of which (such as couch grass and bindweed) can grow from the tiniest fragment of plant material left in the soil. We’re going to be tackling these weeds for some years to come. But if we’re going to stand a chance of getting on top of the problem, we need some chemical help at this stage. Some people caution against rotavating a weed-infested plot because it chops into weed roots and could spread the problem. Elisa (The Secret Garden), who has worked so hard with us to get the plot to where we are now, had offered to hand dig it. It was a generous offer but we felt we would be asking too much if we said yes. We were pondering the problem, when Richard of Anderson Landscapes suggested using a mini digger. It might seem a bit over the top for turning the soil but it would allow us to tackle several other problems at the same time. We’d be able to move some of the banked up soil at the shed-end of the plot to create raised beds. We could use it to demolish the old shed and dig out the base that the shed was sitting on. And we could use it to remove the massive blocks on concrete that Rodney had been bravely trying to dig out. So, that is what we did. In the video below, you’ll see that even the mini digger struggled with some of the concrete! 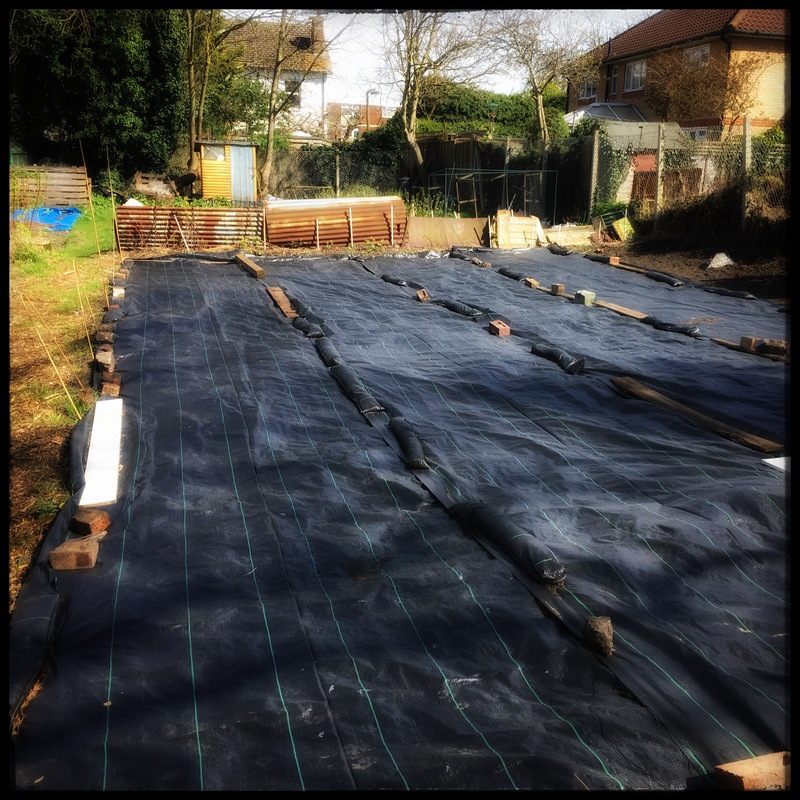 And here is our first raised bed – made with one tonne bags donated by Richard. 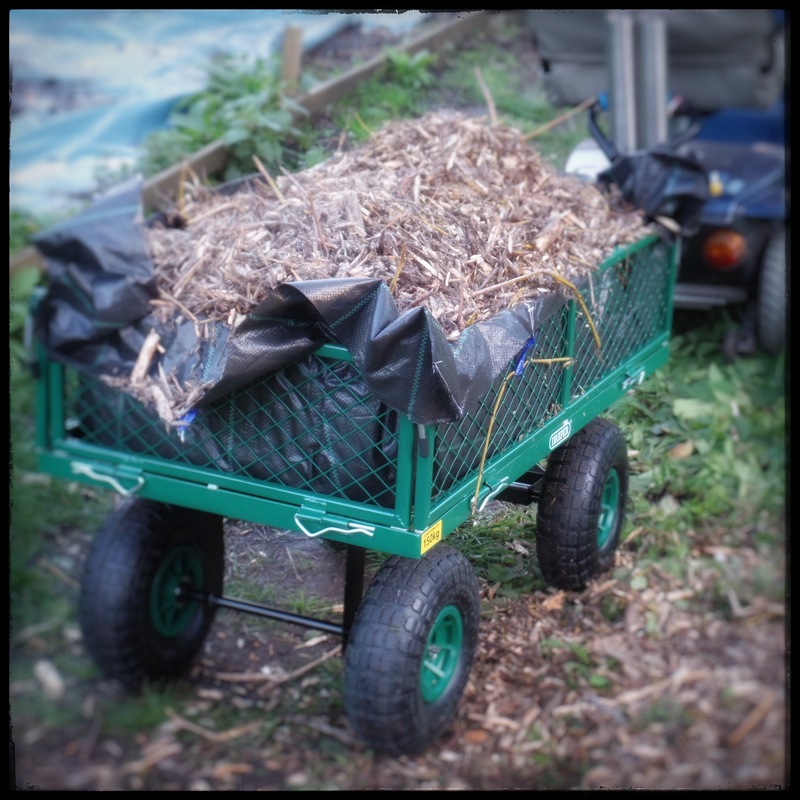 The bags were filled with material from the previous tenant’s old compost heaps. Hopefully, it will look more attractive filled with plants – we’re considering using them to grow pumpkins this year. The fate of the old shed was the subject of robust discussion here at Quest for Veg HQ. On the one hand, although it was structurally dodgy, it did provide a place to store the few items we wanted to keep out of the rain. On the other, it was structurally dodgy. Getting rid of it while we have help would mean that we could start with a blank canvas. In the end, it was probably as well that we got rid of it when we did because it was far more structurally dodgy than we had realised. It was probably only the well-established ivy cover that was holding it up. And the ivy had to go. Mini digger expertise was very kindly provided by Richard Anderson of Anderson Landscapes. And we are grateful to Elisa Contreras (The Secret Garden) for her continued hard work in helping to clear the plot. Our thoughts now turn to the shed versus greenhouse debate! Our allotment goes up in flames! Which is an overly dramatic way of saying we’ve had our first ever bonfire! 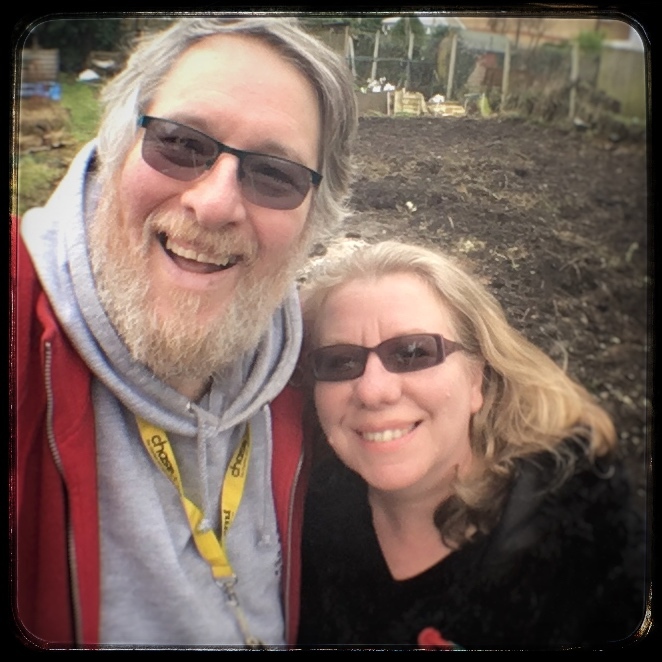 Having spent many hours clearing the plot with the help of our good friends Elisa and Rodney (The Secret Garden), we ended up with two large piles that needed to be cleared. The obvious option was to have a bonfire. Who doesn’t love a bonfire? Well, a local resident, apparently. We had been warned by a fellow plot holder who we met the other day, that there is someone who always complains. And sure enough, despite choosing a still day and trying to keep smoke to a minimum, we heard someone shouting from a nearby garden that we were polluting the whole area (and I thought I was dramatic!). Luckily, it was near the end of the day and most of the rubbish had been cleared by then. While assessing the shed, we were able to take a few more shots of the mystery post that we’re trying to remove from the allotment. As previously noted, the three wooden posts are held together with a coach bolt at the top and embedded in concrete at the bottom. There are no other screw holes or marks of anything being fixed to the posts. There is also a smaller post slightly nearer to the fence, and the two of them are at about a 45 degree angle to the fence. Although at this stage of excavation, it doesn’t look like the two posts are connected, it’s hard to believe they don’t have anything to do with each other. We’d like to thank Rodney from The Secret Garden, for the fantastic job he’s done so far on digging the larger post out. Despite going down a couple of feet, there is no sign of being able to move the post. So, the next plan is likely to involve hitting it hard with a very large hammer! 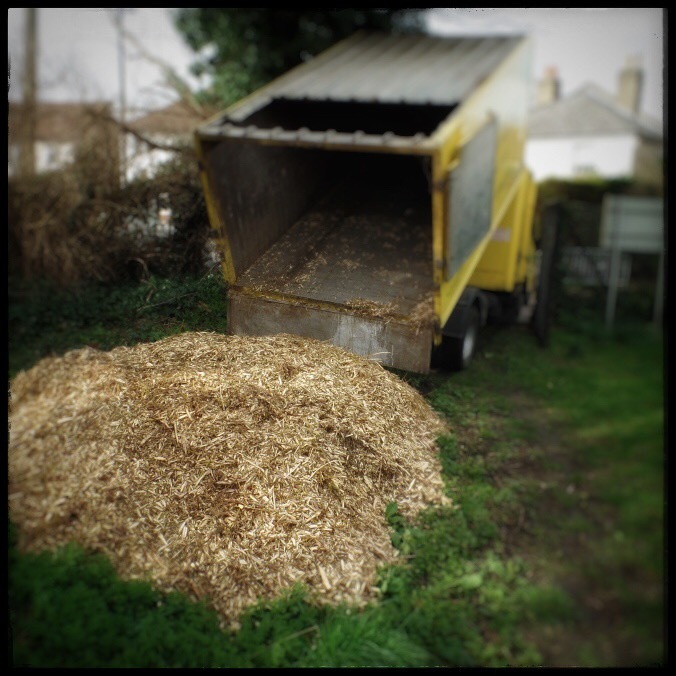 At this stage, we’ve got all the roots out and have made two piles of material which we are hoping to burn – the ash will be good for the soil. Elisa and Rodney, from The Secret Garden, arrived with a good collection of tools. Here’s a selection of their forks! Rodney attacked the larger of the mystery concrete posts. You can see in the film that he’s dug a couple of feet down all the way around it, and still it refuses to move! From what we have uncovered so far, there are three layers of concrete (there may be more underneath that). So, it looks like someone has put concrete down, let it dry, put another layer of concrete down, let that dry, then put a final layer of concrete down and sunk the posts into it. The posts themselves are very solid looking pieces of wood held together with a substantial bolt. There are no obvious signs of something being attached to the posts – no other bolt holes, etc. There is also another a smaller concrete post about a metre nearer to the fence. What on earth the posts were or why someone put them there, we have no idea. We have also started pulling the ivy off the shed. It looks homemade rather than being a bought shed and there are windows all the way round. So, someone has obviously been growing something in it, or at least planned to. But, having uncovered more of it, it looks like bad news. We knew that some of the floor was rotten, and it looks like the eaves have both wet and dry rot. We’ll show more on the shed another day but I think it’s safe to say, we’ll probably need a new one. Another day of hard work from our friends Elisa and Rodney of The Secret Garden. They really are doing a fantastic job of helping us to clear the allotment. As you can see from the video tour, the major work today was to remove some of the big shrubs and dig out the two trees. It is a shame to lose a walnut tree but they grow very big and the council do not encourage tree growing. You can see why: trees cast shade and could take water and nutrients from neighbouring plots. We also want to start with a blank canvas so that we can maximise the potential our site. So, sadly, both trees have to go. We were also very pleased to receive a donation of an incinerator from our good friends Anne and Alan Outram. This will be useful on an ongoing basis but we will probably need to have a big bonfire to get rid of everything we’ve been digging up. 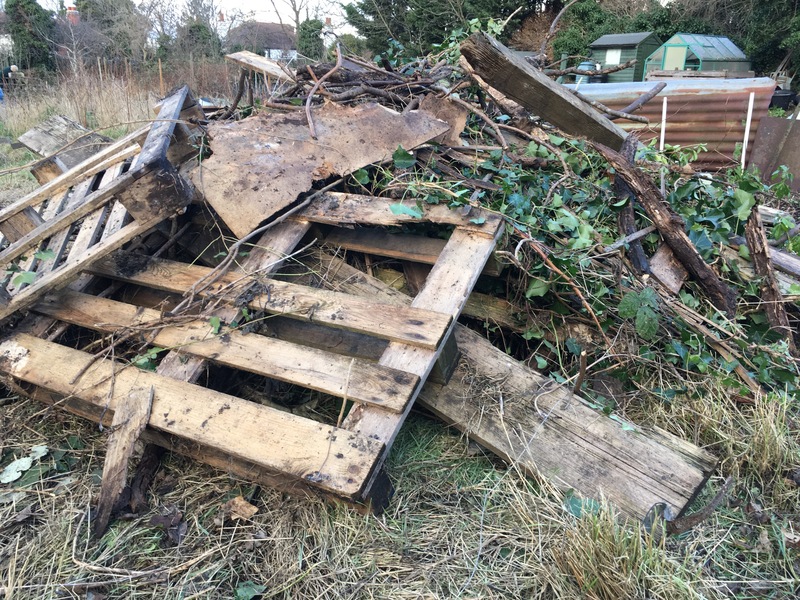 According to the council’s allotment guide, bonfires are banned between 1 April and 30 September. Any bonfire that we have before April, must not emit smoke, fumes or other gases which are a nuisance. It is unlikely that any smoke would go onto a road because we are surrounded by houses. Our best bet is to have it fairly soon while the weather is cold and most people are not spending a lot of time in their gardens. If we have it during a weekday, it is likely that the people in the surrounding houses will be out a work.